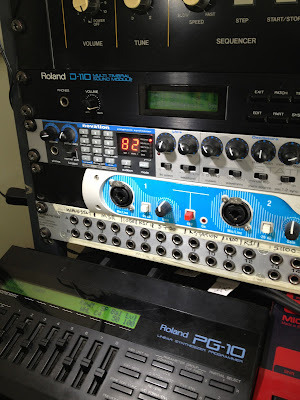 Just bought a Roland D-110 Synth - well, won a D-110 from E-Bay the other day. Got it in the rack and all hooked up - now trying to figure it out ( I thought programming a DX7 was hard!). Both Opcode Galaxy and MidiQuest aren't to happy with it and promply spit out any patch loading/collecting requests, so I might have to do a bit of web detecting for clues, hopefully it ( the D-110) having an older ROM system won't affect anything (v.1.06) looks like 1.10 is the ROM to have. UPDATE.. D'oh! After originally making sure all my midi channels on the patches were going 1,2,3,4,5,6,7,8,10 it seems that they need to be 2,3,4,5,6,7,8,9,10 as the unit was originally supplied - well, at least the first patch has to be and now Galaxy and MidiQuest are happily moving patches back and forth to the D110.